Following the release of Super Mario Odyssey, there is now a Super Mario cereal on the way. 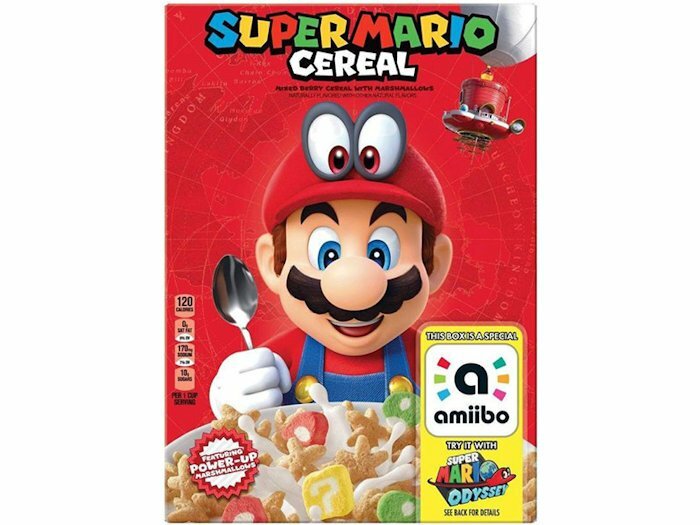 Breakfast blog Cerealousy has uncovered a new cereal with Mario and Cappy on the box. It has star-shaped oats and marshmallow pieces in the shape of Super Mushrooms, 1-Up Mushrooms and ? Boxes. Amiibo stickers too. Some boxes will even include “special Amiibo” that can be used to power-up inside Super Mario Odyssey. Amiibo typically take the form of figurines, although Nintendo does sell card packs separately. This will get fans to buy it for sure. We just hope that it actually tastes good as well. Apparently Super Mario Cereal is already appearing in the inventory systems of major US retailers. Look for it at your local store anytime now and have yourself a bowl while playing games.